We are a Nottingham based company seeking talented individuals to be at the forefront of our expansion into the promotional products market. As a vital member of our sales team, you will be working to generate business to business sales, initially contacting potential customers by telephone, sometimes social media, and with further contact often by email and/or Skype. You will be selling promotional products. These include a very wide range of items, from umbrellas, to T-shirts, through to USB memory sticks, and everything in between. Good telephone manner, with an ability to network and close. Familiar with the use of social media. Ability to work as hard as required to achieve a target. Sales experience is not a must, but it will be an advantage, particularly any experience in business to business sales. Experience in handling promotional goods would be useful, but is not required. We will provide all necessary training. Creating estimates and negotiating prices with prospects. Taking responsibility for client accounts. Building a solid business relationship with clients. The working environment is results driven, but relaxed. We value what our employees achieve. The starting basic salary is a minimum of £18,000 and increases depending on experience and academic qualifications. In addition is a generous commission scheme, with no upper limit. Holiday entitlement is 30 days per annum, including bank holidays, Further to this, there are sometimes extra paid holidays provided over the Christmas/New Year period. This is a full time position. Hours are 9am to 5:30pm (or later as the job requires) with half an hour lunch, Monday to Friday, although if necessary it may be possible to change the times to suite your availability. Most time will be spent in our offices in Netherfield, Nottingham, although some travel may be required occasionally. Complete the job application form below, if possible please include details of your availability and salary expectation. Fields with an * are required, your application can not be processed without them. 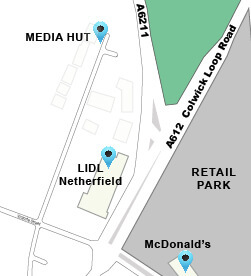 'Media Hut' is a registered Trade Mark of Universal Services (GB) Ltd. within the European Union. © 2019 Universal Services (GB) Ltd.